The RBI's move to issue differentiated banking licences is path-breaking but challenges galore. The billionaire Sunil Bharti Mittal's Bharti Airtel offers a mobile wallet service through 'Airtel Money' in almost all the major cities. It allows customers to load cash up to Rs 50,000 and use it to recharge phone or pay for utility bills, movie tickets or for shopping at malls. The service transfers money instantly just like a credit or debit card. Airtel, with its more than 300 million mobile customers, is not alone in offering mobile wallet services. There are actually two dozen players from telecom companies to Sodexo to Subhash Chandra's ItzCash card. They are all licensed by the Reserve Bank of India (RBI) as Prepaid Payment Instruments (PPIs) and have to maintain an escrow account with a commercial bank. No interest is paid on the deposits. The RBI comes into the picture as it regulates acceptance of deposits from the public. Last week, the RBI released its draft guidelines for two new categories of banks - payment banks and small banks. The final guidelines will be issued in August after receiving feedback. The biggest advantage for companies in shifting from prepaid cards to a bank is the right to raise savings and current accounts up to Rs 1,00,000 from a customer. These deposits will get annual interest of four to five per cent and must be invested in government securities that return eight to nine per cent interest. There appears to be a clear return of two to three per cent after factoring in the operational costs. The market for such deposits is huge. As per RBI estimates, the outstanding deposits as on March 31, 2013, was Rs 74,29,500 crore. The top 100 cities contribute close to 70 per cent of the banks' deposits. But it isn't easy for a new player to garner low-cost deposits. State Bank of India (SBI), the largest bank in the country, gets 50 per cent of its deposits from low-cost current and savings accounts. In the private sector, ICICI Bank gets around 40 per cent of its deposits as current and savings account. 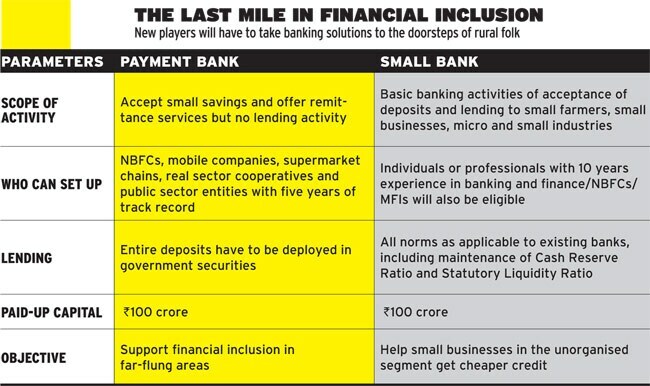 "The business of mobilising deposits in rural and semi-urban areas requires a different mindset. You will need higher volumes because of lower value deposits," says Rishi Gupta, Chief Operating Officer, Fino PayTech, the country's largest banking correspondent. The firm, a candidate for payment bank, also provides technology solutions to banks and financial institutions to reach out to rural areas. The new players will have to take banking solutions to the doorsteps of rural folks using technologies that can process transactions instantly. But why would a customer go to payment banks when post offices exist in every nook and corner of the country? There are over 1.55 lakh post offices and 90 per cent of them are in rural areas. People are also familiar with post office savings product that offers four per cent interest a year and five-year recurring deposits with 8.4 per cent a year. But experts are not amused. "Post offices don't have the technology backbone. The model is brick and mortar, which is a costly way of doing business," says Gupta. People's interaction with post offices is diminishing. "Nobody in metros or urban areas goes to post offices to send letters," says Amit Lakhotia, Vice President (Payments) at Paytm, an RBI-licensed prepaid card provider. Sceptics fear the proposed payment banks may end up catering to customers in metro and semi-urban areas. Gupta, whose firm is evaluating a payment bank licence, agrees that the trust that people have in post offices will be a big challenge and so financial literacy to develop an ecosystem is a must. The rural and semi-urban masses have in the past borrowed money from private banks but there is little proof to show that they trust in depositing money in these banks. There have been instances of rural folk depositing money in ponzi schemes. "We had to do a lot of cajoling [to woo rural customers]," says Lakhotia. Sceptics fear that the proposed payment banks may end up catering to customers in metro and semi-urban areas as that's where big money lies. For instance, the prepaid mobile wallets generate the maximum volumes in top metros and urban centres. "The banking licences shouldn't defeat the purpose for which they are being set up," says the CEO of a non-banking financial company. 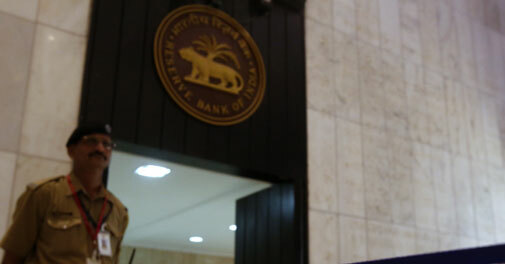 The RBI has stated in its draft guidelines that payment banks are being set up to further financial inclusion by providing small savings accounts and payment and remittances services to migrant labourers, low-income households and small businesses. Lakhotia says every player has to evaluate the financial viability of the proposed payments banks. "The margins will be wafer thin as commercial lending like what the full-fledged banks do is restricted here," he says.